Olympic superstar Usain Bolt made the move from the track to the field with his celebration Friday. Usain Bolt may be making a move from the track into the field, as the sprinting superstar celebrated his ninth gold medal on Friday night by slipping back out into the arena to toss the javelin around. After completing his historic “triple-triple” by winning gold in the 100m, 200m and 4x100m relay for a third consecutive Olympics, Bolt went inside to speak with the media and then came back to the infield where he tried his hand at the javelin. Is that good enough to make the Jamaican track and field team as a javelin thrower for the 2020 games in Tokyo? Even if its not, can the Jamaican Olympic committee really say no to any request from Bolt at this point? 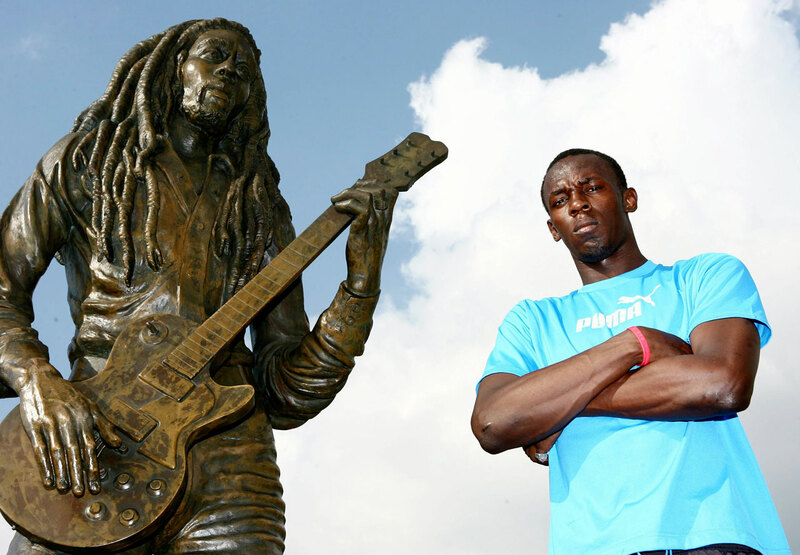 Usain Bolt, next to a statue of fellow countryman and legendary reggae singer Bob Marley in 2007, was born in Trelawny, Jamaica, on Aug. 21, 1986. 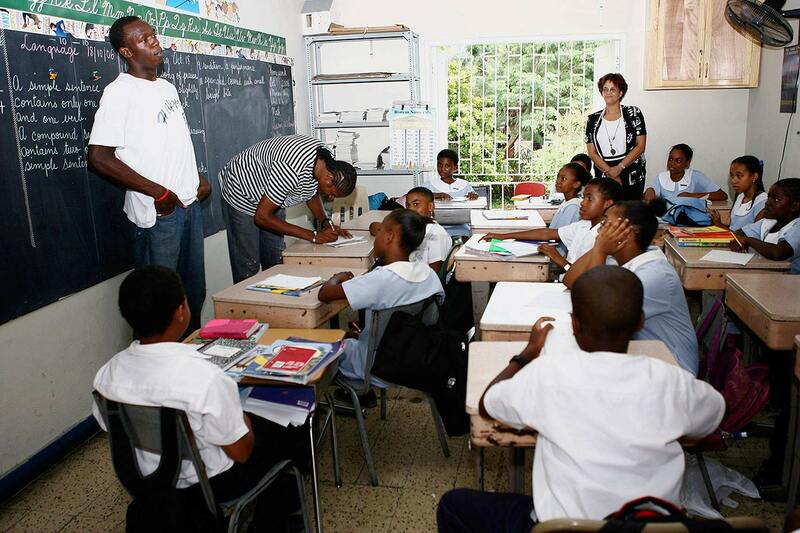 A resident of Kingston, Jamaica, Usain Bolt is pictured here in 2007 during a visit to a grade school. 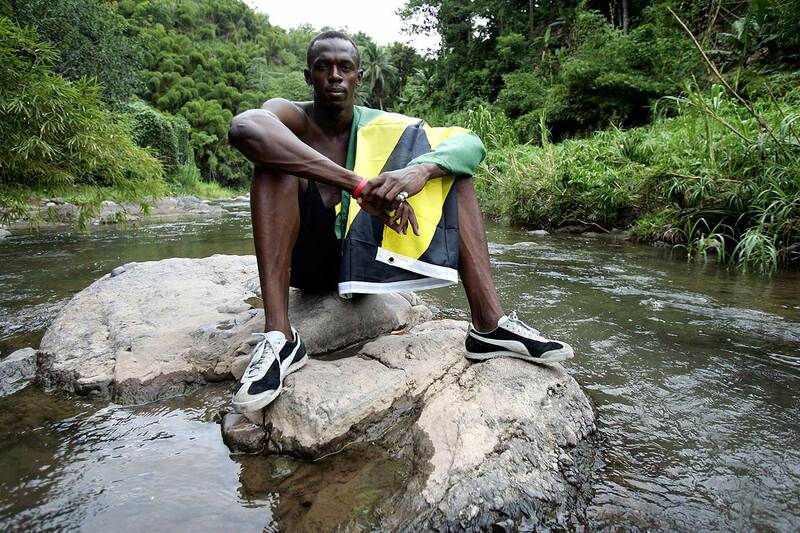 Usain Bolt, pictured here in his native Jamaica in 2007, burst onto the track and field scene at 14. 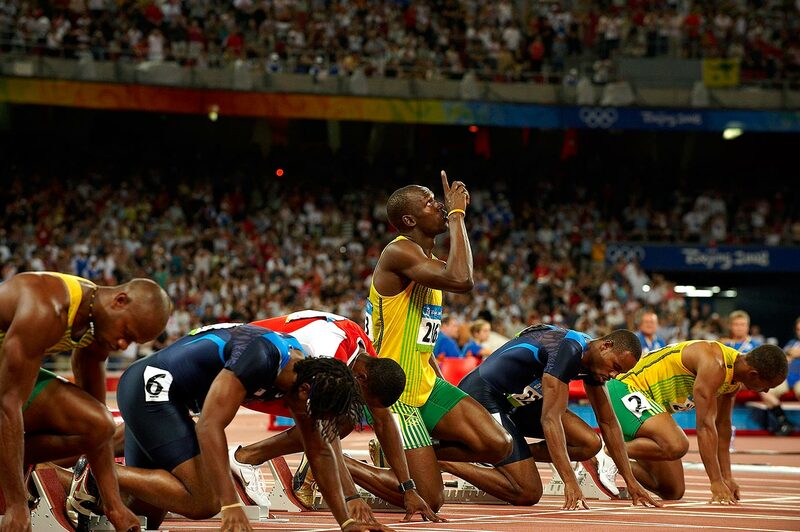 In 2002, at 16, Bolt set the world junior record for the 200m at 19.93 seconds. Usain Bolt looks up before the start of the 100m semifinals during the 2008 Summer Olympics in Beijing, China. 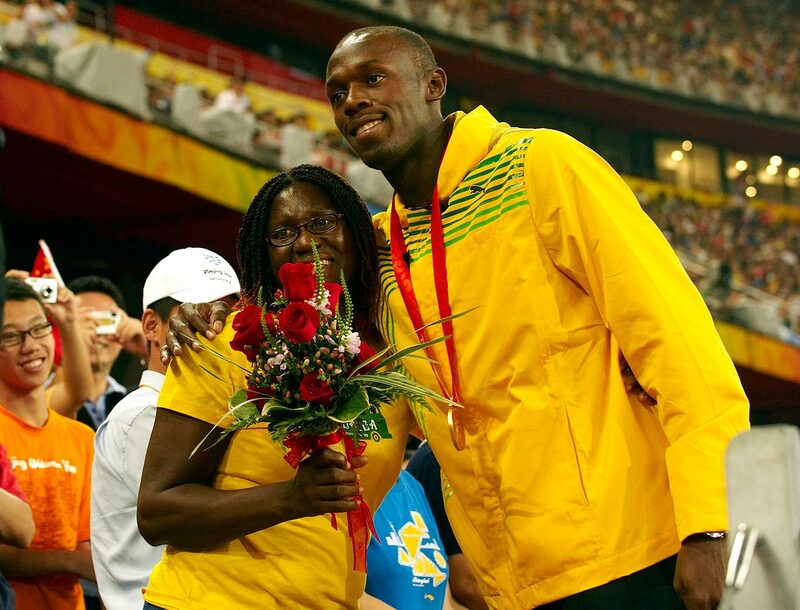 Usain Bolt poses with his mom, Jennifer, after winning the gold medal in the men's 100m final with a world record time of 9.69 during the 2008 Summer Olympics in Beijing, China. Usain Bolt helps Boston Celtics mascot Lucky perform a trick dunk during a break in the action at a 2008 Boston-Chicago game. 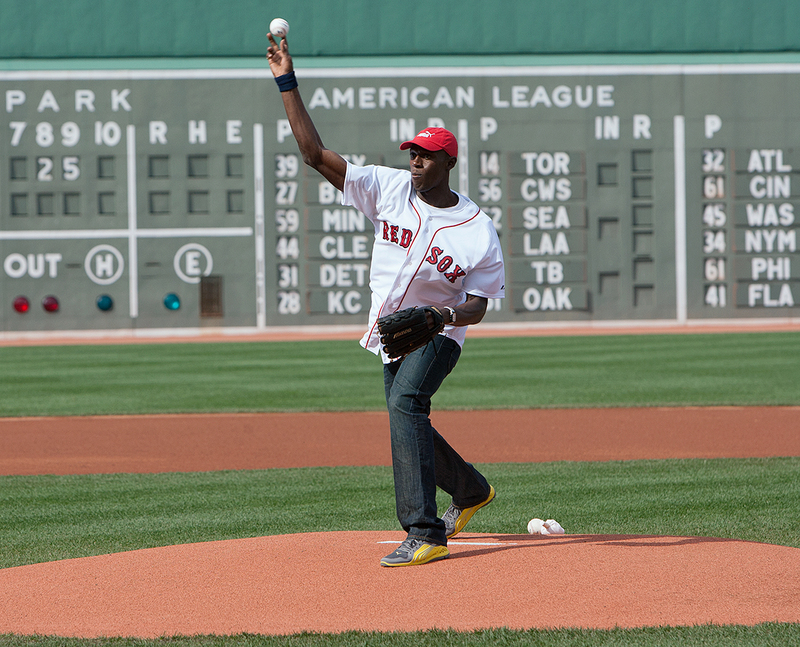 Usain Bolt throws out the first pitch before a Boston Red Sox game against the New York Yankees in 2009 at Fenway Park in Boston. 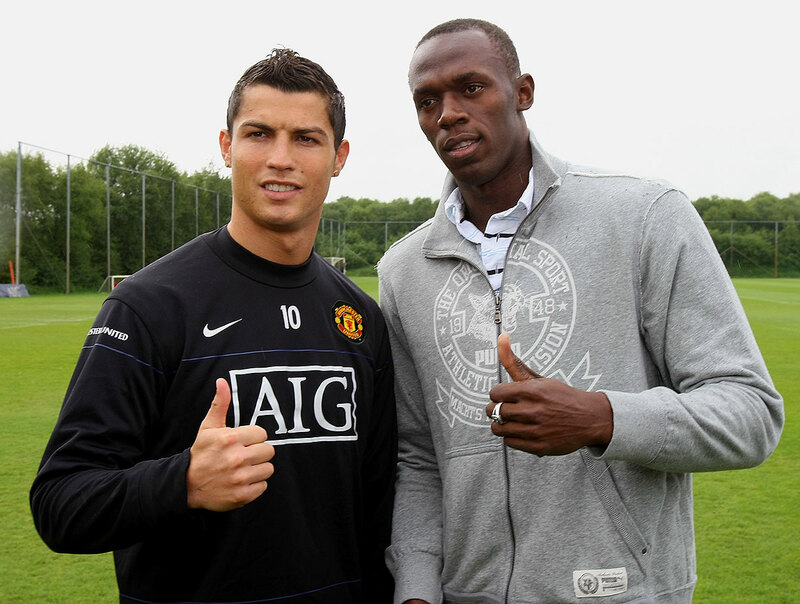 Usain Bolt poses with Manchester United star Cristiano Ronaldo ahead of a First Team training session at Carrington Training Ground in Manchester, England. Ronaldo left United to join Spanish side Real Madrid later in 2009. 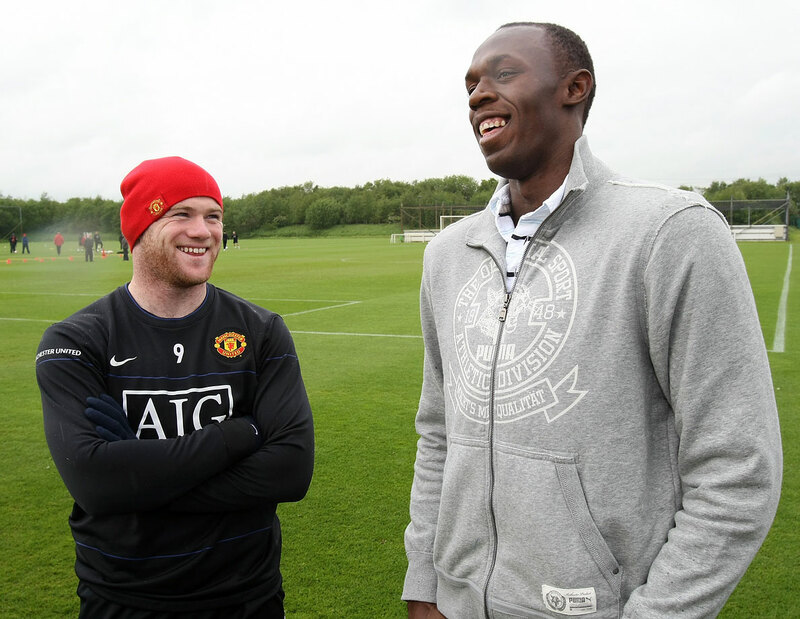 Usain Bolt shares a laugh with Manchester United star Wayne Rooney ahead of a First Team training session in 2009 at Carrington Training Ground in Manchester, England. 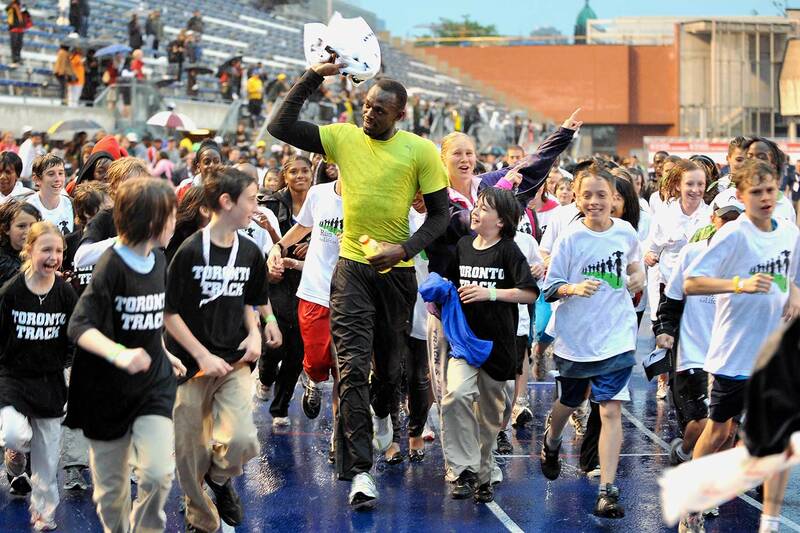 Usain Bolt runs the track with kids at the 2009 Festival of Excellence meet at Varsity Stadium on the University of Toronto Campus in Ontario, Canada. 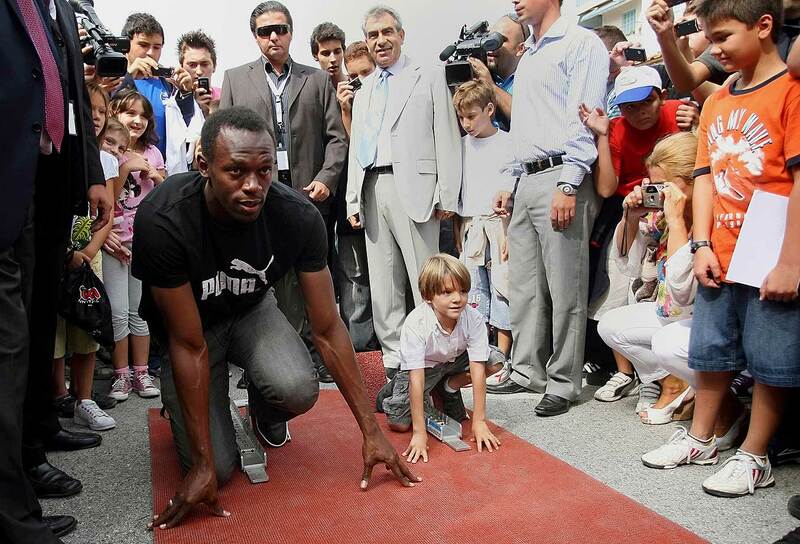 Usain Bolt lines up in a starting position alongside a young boy in Thessaloniki, Greece. Bolt competed in the 200m during the 2009 World Championships a couple days later, setting a track record of 19.68 and taking home a gold medal. Usain Bolt holds a cheetah cub at the headquarters of the Kenyan Wildlife Service in Nairobi. 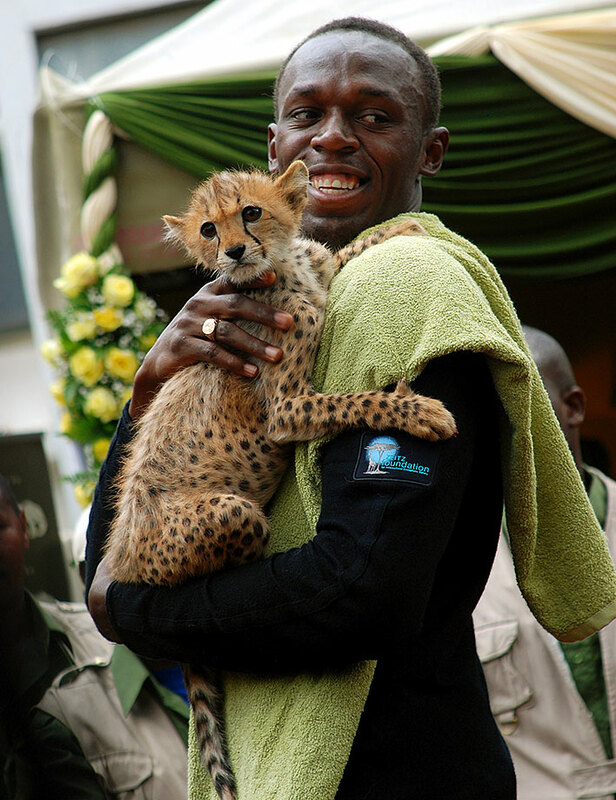 Bolt adopted a cheetah and named her "Lightning Bolt" during the 2009 Zeitz Foundation launch in Kenya. 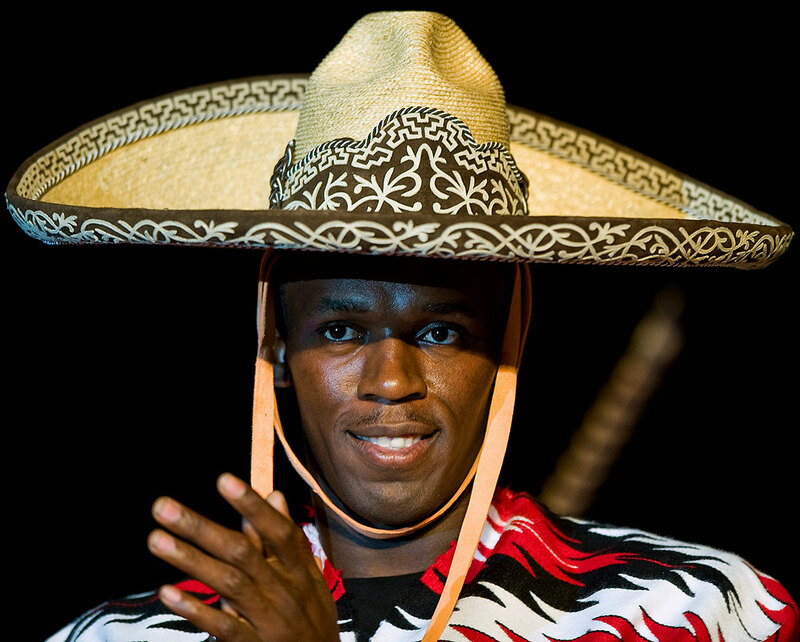 Usain Bolt sports a sombrero during a 2009 conference at the World Sport Congress in Mexico City. Usain Bolt goofs off by teeing off into the Caribbean Sea during the quarterfinal matches of the 2010 Mojo 6 Jamaica LPGA Invitational in Montego Bay. 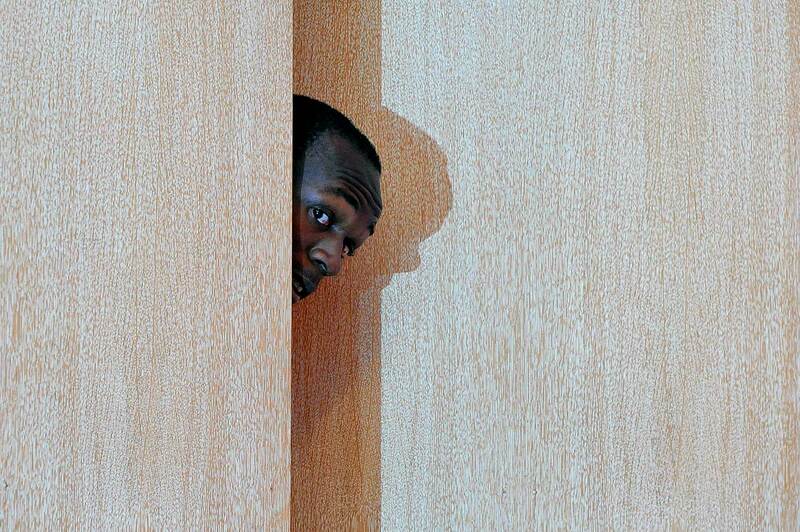 Usain Bolt appears bashful during a 2010 Areva Track Meet press conference. 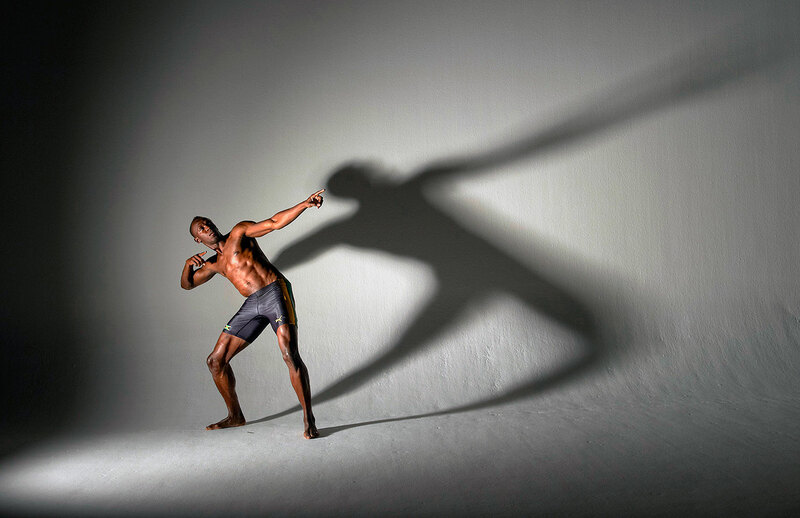 Usain Bolt, captured here during a 2011 SI photo shoot, owns three world records, six Olympic gold medals and 11 World Championship gold medals. At 6'5", 200 pounds and blessed with raw athleticism, Usain Bolt, pictured here in 2011, is one of the world's most naturally gifted athletes. Usain Bolt attends the 2011 International Association of Athletics Federations (IAAF) World Gala in Monte Carlo, Monaco. Usain Bolt won Athlete of the Year at the 2011 IAAF World Gala. Prince Harry races ahead of Usain Bolt in 2012 at the Usain Bolt Track at the University of the West Indies in Kingston, Jamaica. 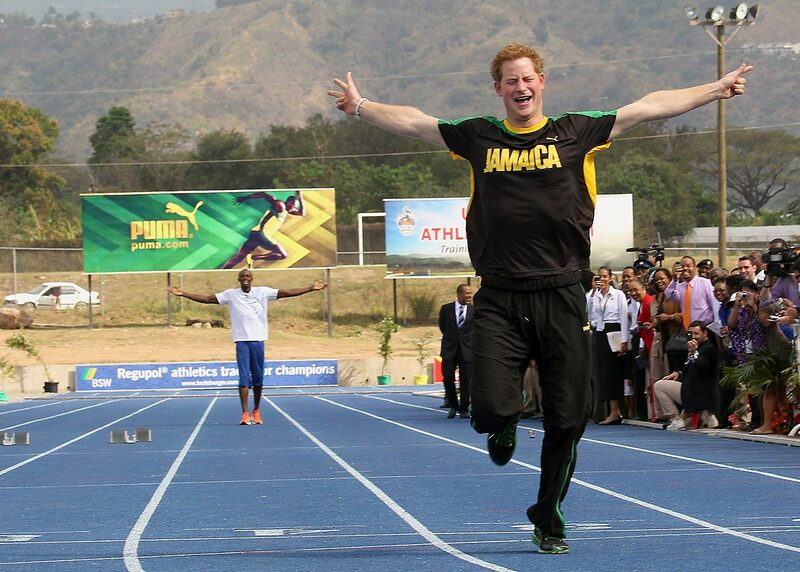 Prince Harry was in Jamaica as part of a Diamond Jubilee Tour. 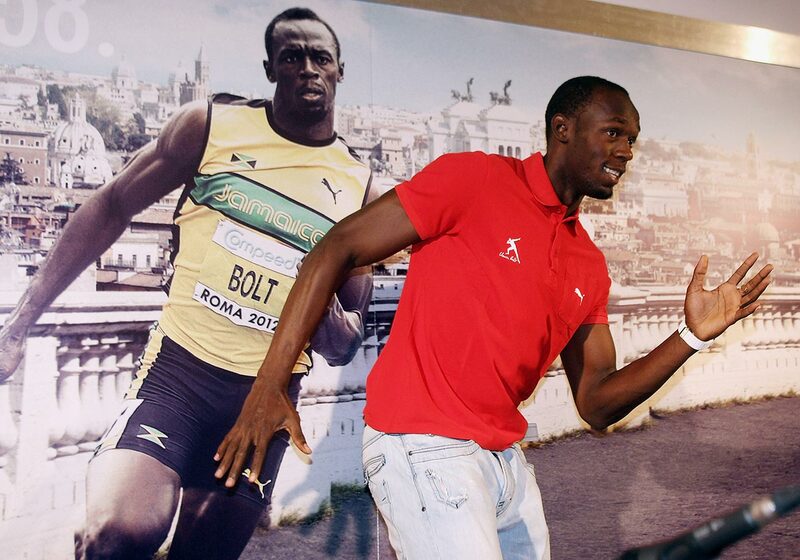 Usain Bolt re-enacts a photo of himself at a 2012 IAAF Golden Gala press conference in Rome. Usain Bolt models a Jamaica Olympic kit with designer Cedella Marley, daughter of Bob Marley, during the 2012 kit unveiling in London. 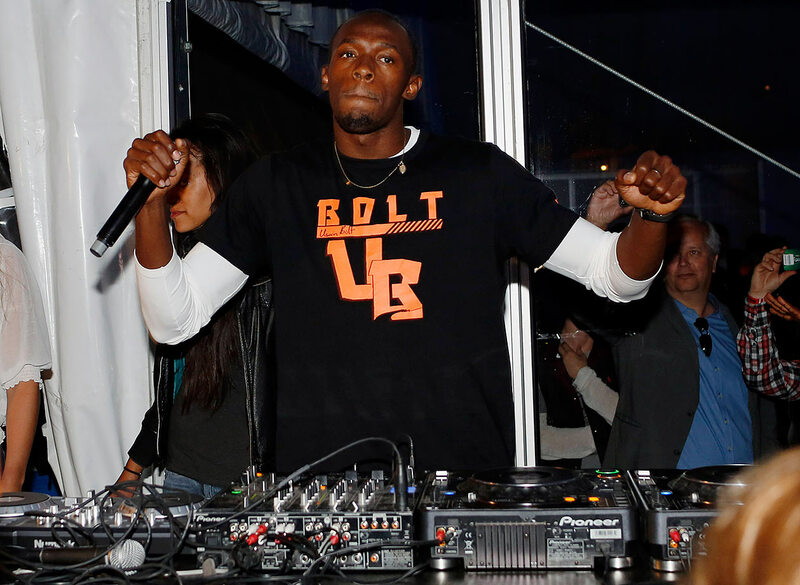 Usain Bolt DJs in the evening after winning the 100-meter race at the 2012 IAAF Diamond League athletics meet at Bislett Stadium in Oslo, Norway. 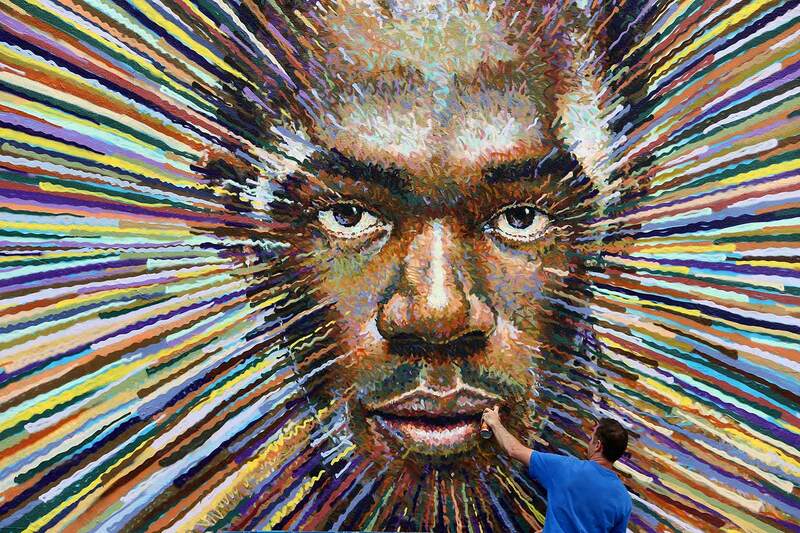 Street artist James Cochran puts the finishing touches on a piece depicting the face of Usain Bolt in London as a lead-up to the opening of the 2012 London Olympic Games. 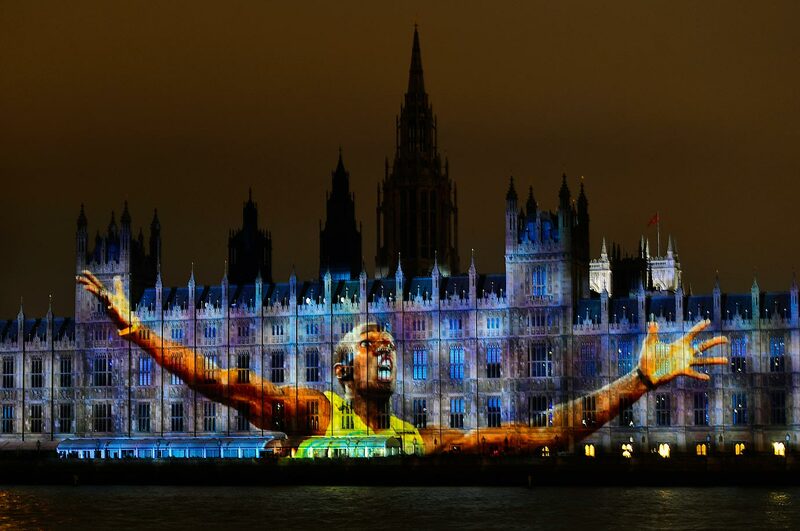 An image of Usain Bolt is projected on The Houses of Parliament in London during the Opening Ceremony of the 2012 Olympic Games. 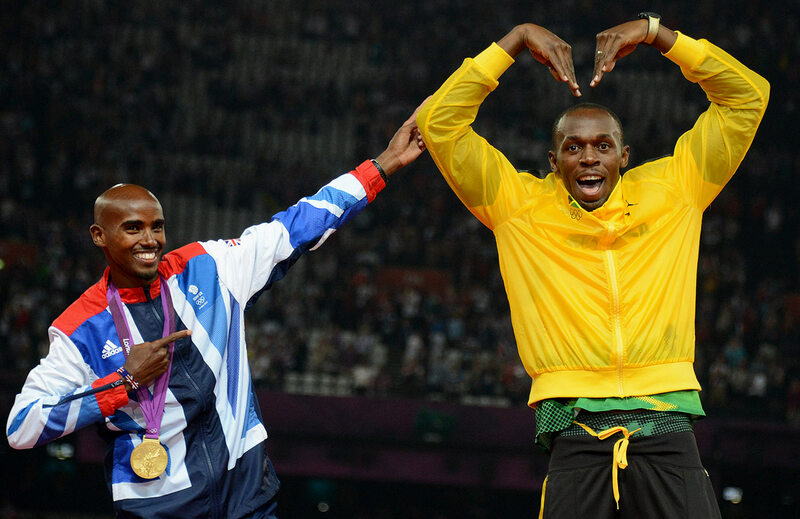 Usain Bolt has fun with Great Britain's 5000-meter gold medalist Mohamed Farah during the 2012 London Olympic Games. 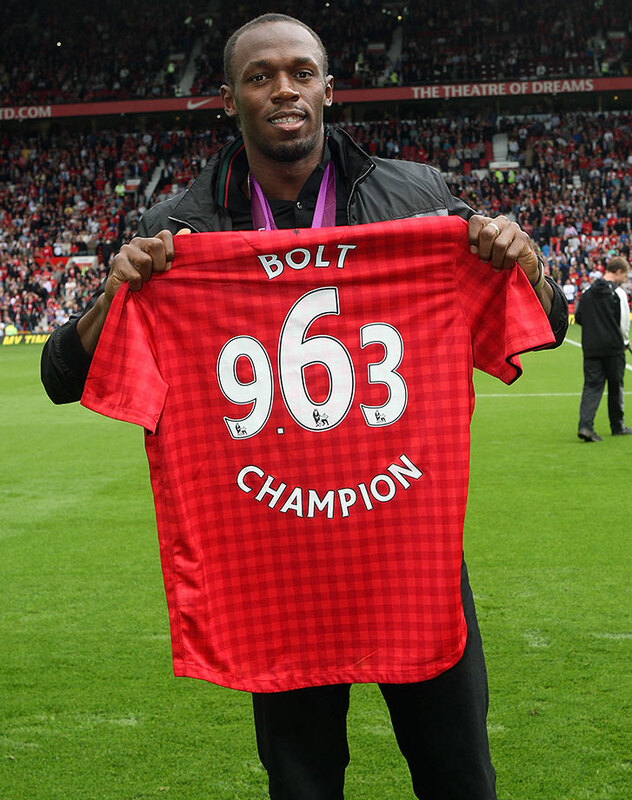 Usain Bolt, a proud supporter of English Premier League giant Manchester United, poses on the pitch at Old Trafford ahead of a 2012 league match between Manchester United and Fulham. He is sporting a custom jersey embroidered with his Olympic gold medal-winning time of 9.63 seconds, which he set in the 100m at the London Games. 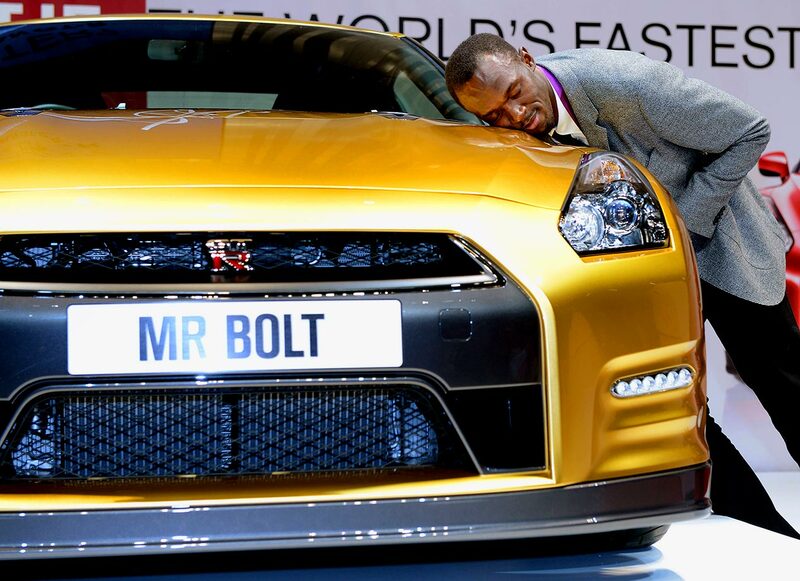 Usain Bolt hugs a Nissan GT-R at a 2012 promotional event at the Nissan Motor Company headquarters in Yokohama, Kanagawa, Japan. 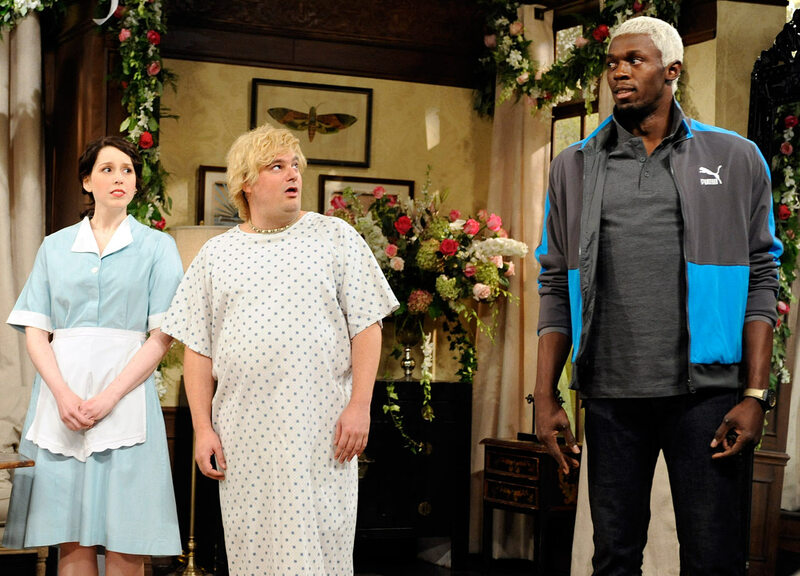 Usain Bolt's success and playful antics earned him a guest role on NBC's "Saturday Night Live" in 2012. 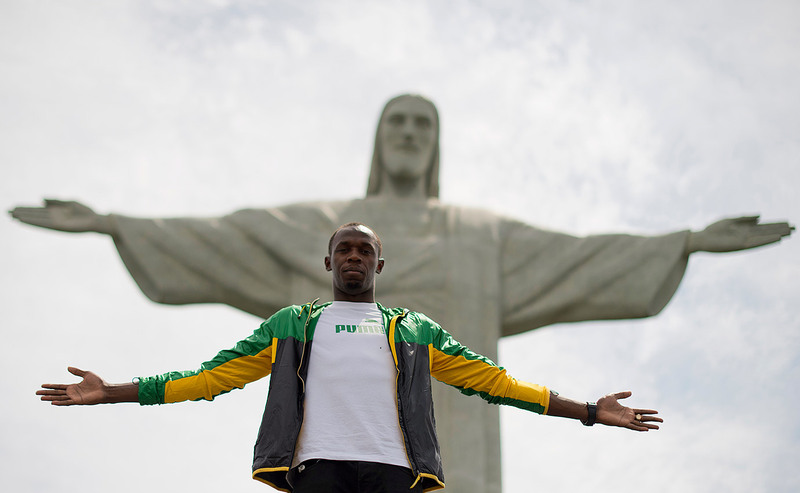 Usain Bolt poses in 2012 under the Christ the Redeemer statue on Corcovado Mountain in Rio de Janeiro, Brazil. 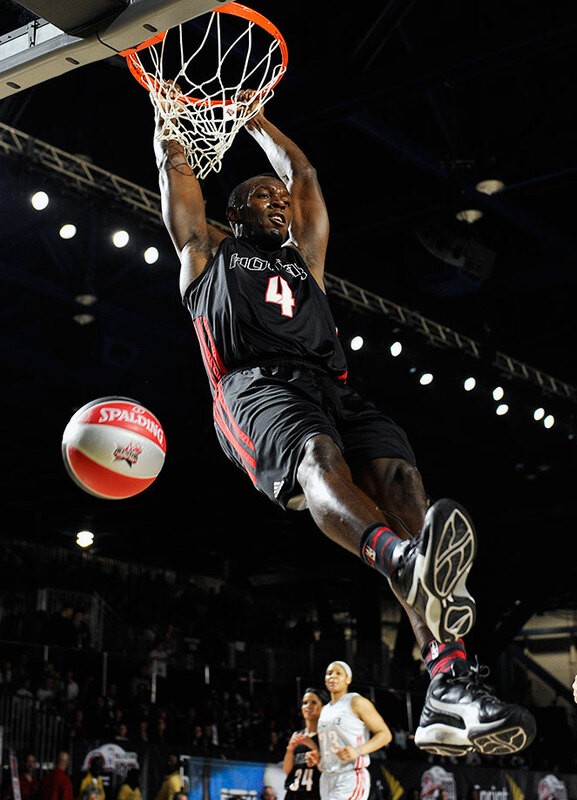 Usain Bolt dunks during the first quarter of the 2013 NBA All-Star Celebrity Game in Houston. 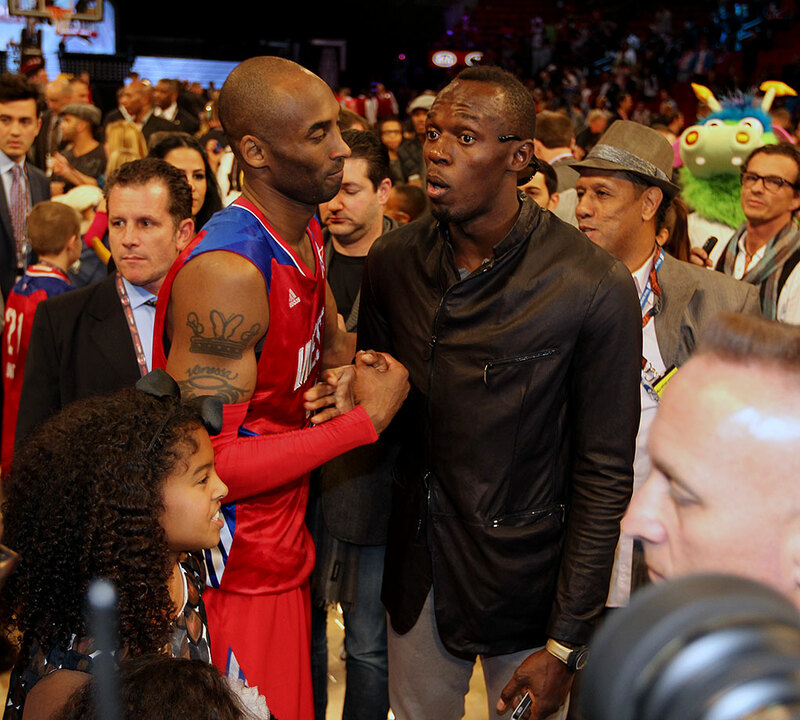 Usain Bolt greets Los Angeles Laker and Western Conference All-Star Kobe Bryant after the 2013 NBA All-Star Game at the Toyota Center in Houston. 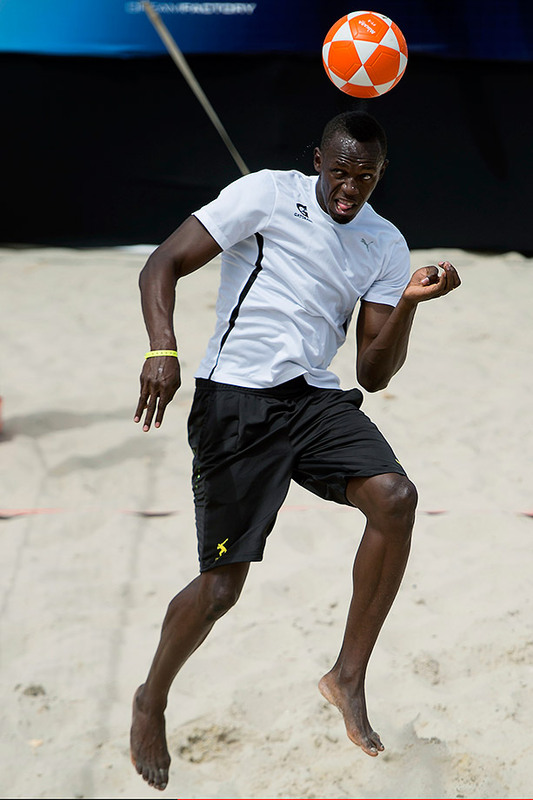 Usain Bolt plays footvolley during a "Mano a Mano" challenge in 2013 at Copacabana Beach in Rio de Janiero. 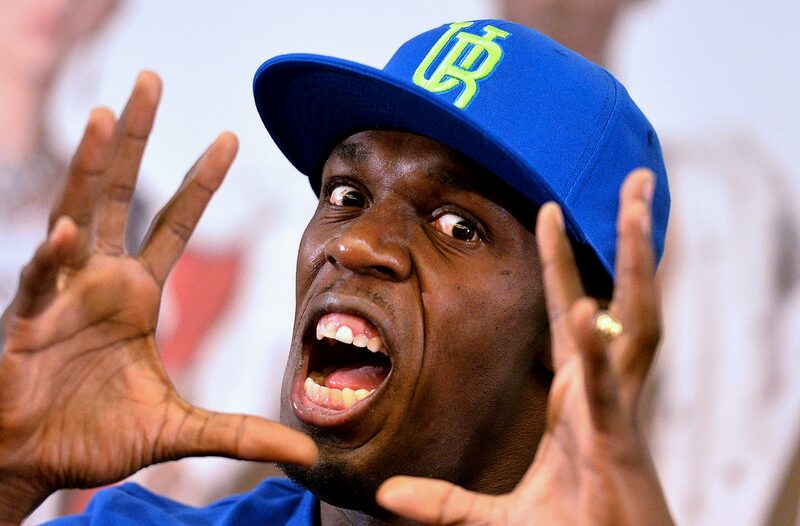 Usain Bolt jokes around with photographers during a news conference on the eve of the 2013 IAAF Golden Gala in Rome. Bolt would finish second to Justin Gatlin of the U.S. in the 100-meter dash, creating a bit of intrigue heading into the August world championships in Moscow. 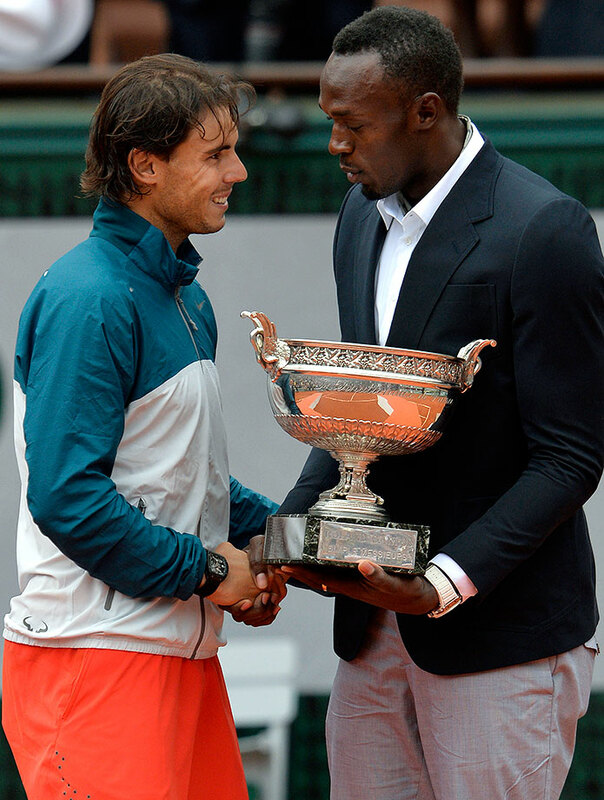 Usain Bolt hands the Musketeers Trophy to 2013 French Open winner Rafael Nadal. With the win, the Spaniard became the first player to capture eight Grand Slam titles at the same event. 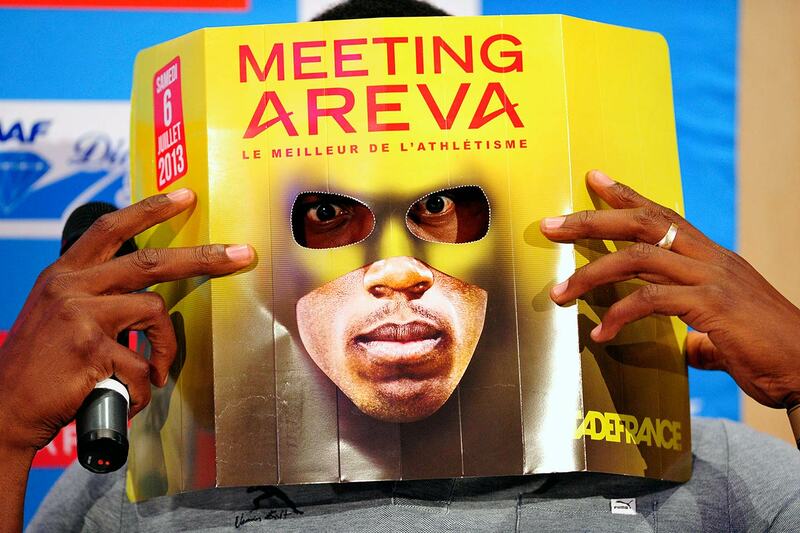 Usain Bolt looks through a leaflet displayed as a mask as he poses after a 2013 press conference in Paris. 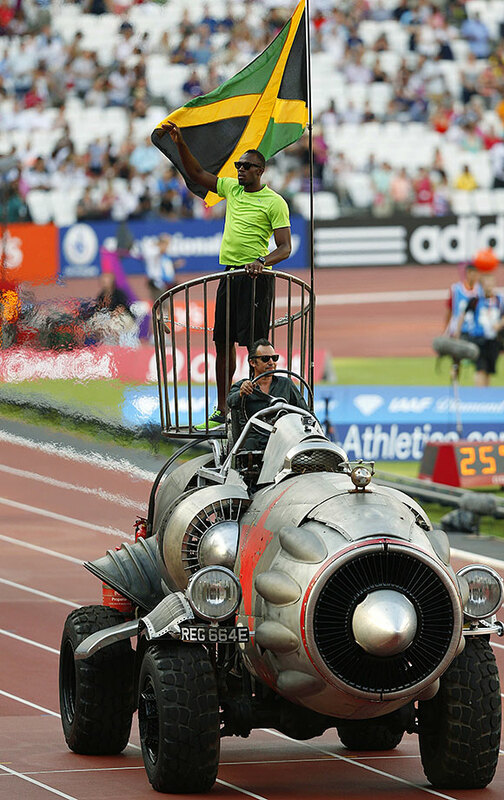 Usain Bolt parades around Queen Elizabeth Olympic Park on a rocket-like vehicle before the start of the 2013 Diamond League athletics meet in London. 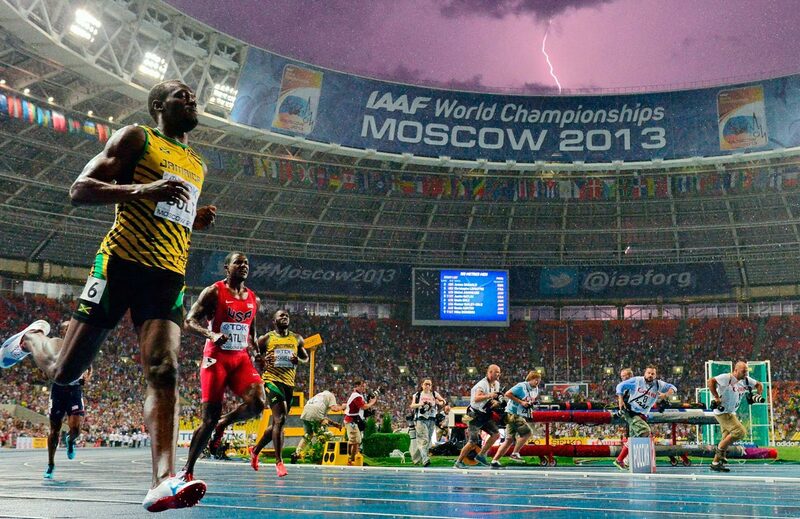 Usain Bolt wins the 100m final at the 2013 IAAF World Championships while a lightning bolt strikes in the sky above Luzhniki Stadium in Moscow. 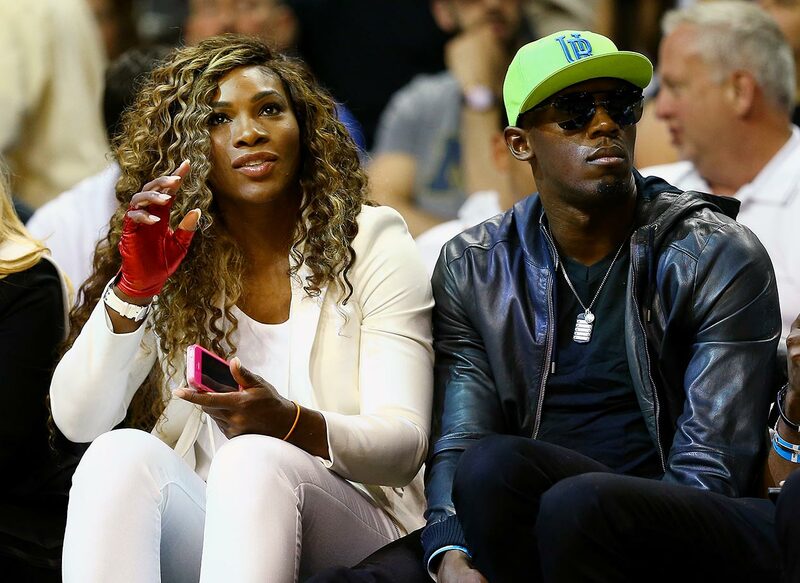 Usain Bolt sits alongside Serena Williams during Game 4 of the 2014 NBA Finals between the Miami Heat and San Antonio Spurs at American Airlines Arena in Miami. 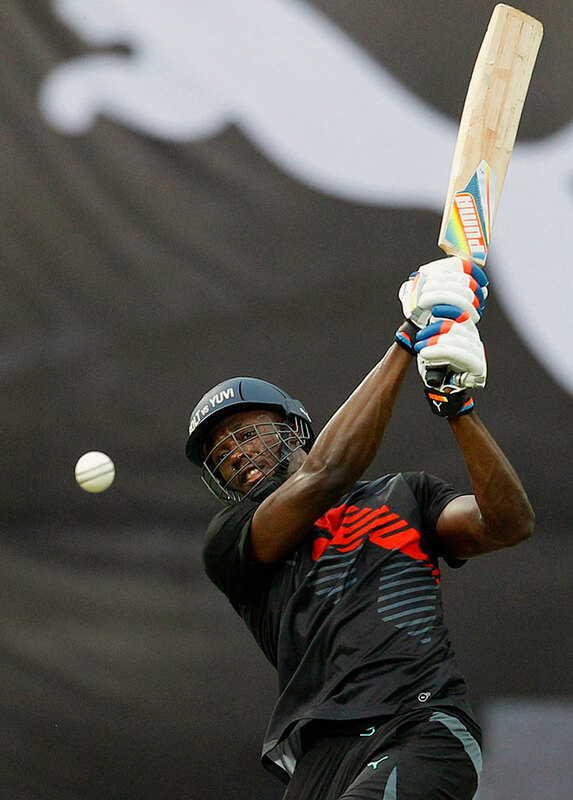 Usain Bolt hits a boundary during a friendly cricket match in 2014 against Indian cricketer Yuvraj Singh's team in Bangalore, India. Bolt's team won the match. Usain Bolt points to his beer during 2014 Oktoberfest at Schuetzenzelt/Theresienwiese in Munich, Germany. Usain Bolt crosses the finish line ahead of Americans Justin Gatlin, Tyson Gay, Mike Rodgers and Trayvon Bromell in the Men's 100m Final during the 2015 IAAF World Championships at National Stadium in Beijing, China. 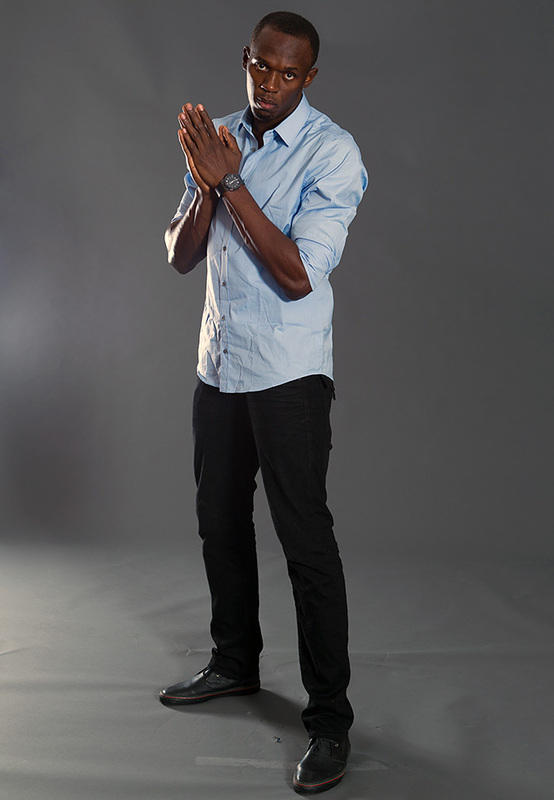 Usain Bolt poses during a 2016 photo shoot at Truman Bodden Sports Complex in George Town, Cayman Islands. Usain Bolt crosses the finish line to win the Men's 100m Final during the 2016 Summer Olympics at Olympic Stadium in Rio de Janeiro, Brazil. Usain Bolt of Jamaica smiles while dominating his competition in a 100-meter semifinal race. Usain Bolt poses alongside a screen after becoming the first man in history to win three consecutive Olympic golds in the 100m during the 2016 Summer Olympics at Olympic Stadium in Rio de Janeiro, Brazil. Since winning his transcendent 100-meter gold medal at the 2008 Olympics in Beijing, Bolt has raced 21 global championship races and won 20. 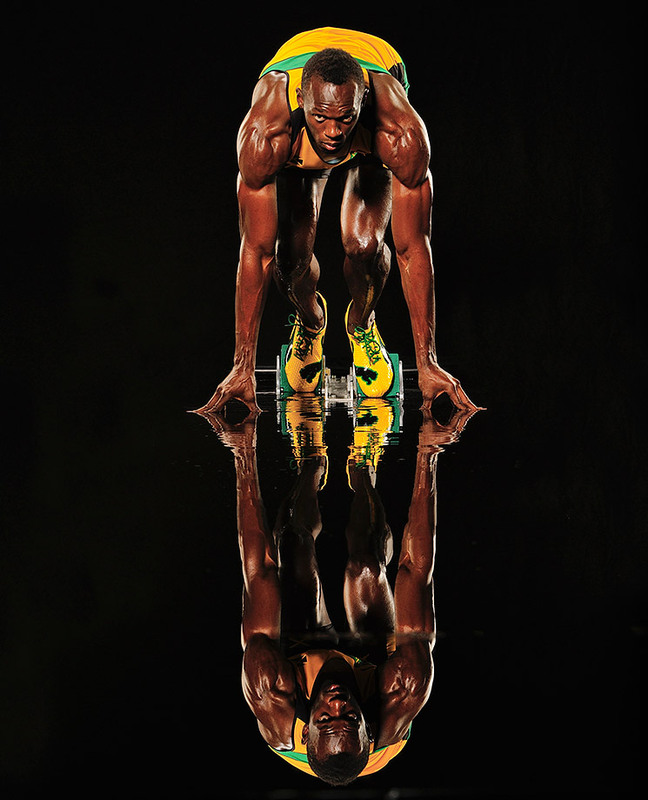 He has helped lift Jamaica from a running curiosity with occasional medalists to a worldwide sprint power.